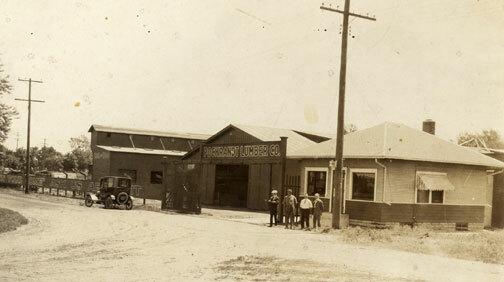 Pockrandt Lumber and Fuel Company was a landmark business in the Park during most of the 20th Century. Located at 6325 Highway 7, the firm was situated on a triangular piece of property between the railroad tracks and Highway 7, across from the High School (Central). It was well positioned to take advantage of the Park’s housing boom following World War II. 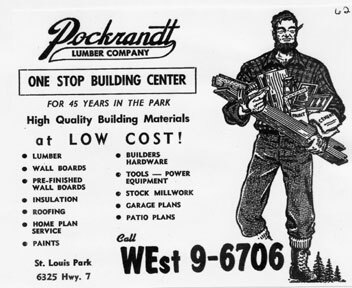 Various ads seem to indicate several different years that the original lumber yard opened. One says that it was founded in 1900 and even provides a photo. Others compute to 1914, 1917, even as late as 1918. Highway 7 itself was not built until 1934 – before that the business was listed at Main and Highland (Dakota and 36th). The Burnham-Kilbourne Lumber Company is listed in The Lumber Trade Journal, New Orleans, on January 1, 1909. The company sponsored a baseball team that year that included Frank Werner, Peanuts Nelson, Dutch Miller, Al Olson, Ray Johnson, Irving Johnson, Andrew Nelson, Carl Nelson, William Klebs, Bob Hinkle and Jack Nelson. Burnham-Kilbourne built a new office and store at 4318 Upton Ave. So. in Minneapolis in 1909, as cited in the Improvement Bulletin of Minneapolis on October 23, 1909. There may have been a fire at the St. Louis Park lot in 1910. There is an ad for the Kilbourne Lumber Company, St. Louis Park and Lake Harriet (4318 Upton), in 1914. A notice in the Mississippi Valley Lumberman dated January 8, 1915, states that Pockrandt bought out the Kilbourne yard. 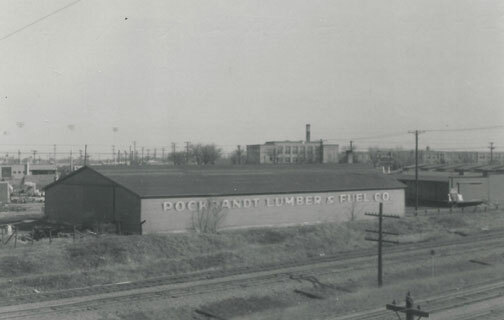 The business became Pockrandt Lumber and Fuel. Although it was obviously named for and possibly owned by Julius E. Pockrandt, Minneapolis directories consistently list Pockrandt as the secretary and treasurer and A.C. Andrews is listed as president. The 1930 Census lists Pockrandt as the proprietor. In 1934 general manager is added to Pockrandt’s titles, but Andrews remains listed as president in the directories until at least 1944. (Pockrandt is listed as president in the 1940 Census.) In 1944 E.M. Hamre is listed as general manager. In 1941 the company added another location in Inver Grove. The St. Louis Park yard burned down on October 27, 1921, causing an estimated $75,000 in damage. The Minneapolis Tribune reported that the fire lit the sky for miles, swept over 25 city lots, and caused $75,000 in damage. “Half a million feet of lumber and 720 tons of coal were destroyed. The adjoining tracks of the Minneapolis & St. Louis railroad were badly warped. The loss is only partly covered by insurance. Large crowds of Minneapolis residents who gathered in automobiles were thrilled when a Minneapolis & St. Louis switch engine crew backed into the track nearest the yards and drew out three box cars filled with lumber, one of which as ablaze.” Joe Williams said his volunteer firefighters were hampered by the lack of water pressure. Minneapolis sent three companies to help guard against the spread of the fire. 1955 The old Central building is in the background. 1962 – the huge sign with the signature lumberjack was a familiar sight on Highway 7. It is unclear when the company closed. It is last listed in the St. Louis Park directory in 1966. However, in 1967, City Council minutes indicate that the company requested that Dakota Ave. south of Highway 7 be vacated. Dakota at that location would have run right through the property. It may have been that the company sought to consolidate the property in order to sell it. The site is now part of the 6363 Hwy 7 parcel, a parking lot and drainage structure. Julius Edward Pockrandt was born on November 4, 1874 of German parents. His birthplace is variously reported in the Census as Russia (1910), Prussia (1920), Russia (1930), and Germany (1940), reflecting political changes in his homeland. He came to the U.S. in the 1890s (also variously reported). He married wife Florence on August 12, 1902 in Minneapolis. Minneapolis directories from 1903 to 1910 report his occupation as bookkeeper. The 1910 Census reports his occupation as bookkeeper for a lumber company. From about 1916 to 1919 the family lived in St. Louis Park – otherwise they lived in Minneapolis. Florence and Julius had a daughter, Helen Pearl, born on July 1, 1903, who apparently died young as she does not appear in the 1910 Census. Daughter Dorothy (Barrett) was born in about 1906. Julius was a member of many civic organizations, including Minneapolis Scottish Rite, Zuhrah Temple of the Shrine, the Hoo Hoo club, Six o’Clock club, the Minneapolis Athletic club and the Automobile Club of Minneapolis. Julius died on February 16, 1948 in Phoenix, Arizona. He had been active in the management of both lumber yards until his death.